A wholefoods meal replacement formula for vegans and vegetarians! Finding a quick, easy, but most importantly, complete meal replacement for the vegan and vegetarian can be difficult on the run, but not when you have the Vegan Wholefoods Meal Replacement Formula to help you out! 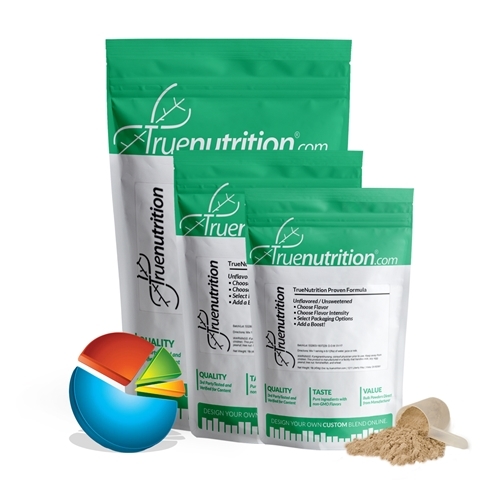 By combining three of the highest-quality vegetable and grain-based protein powders with oats, psyllium fiber, and Medium Chain Triglycerides, True Nutrition has created a great-tasting, great-mixing meal replacement formula to meet your vegan lifestyle! For the best tasting, all-natural results, we recommend mixing with our signature all-natural and non-GMO TrueFlavor flavoring systems! Uses: Meal Replacement: Provides 14g of protein to help support muscle building! Mix-ability: Shake or stir rigorously for best results. Taste: Mild earthy taste that tastes great in any flavor! Pea Protein Isolate, Rice Protein Concentrate, Hemp Protein, Oat Starch Powder, Psyllium Seed Husk Fiber, Medium Chain Triglycerides Powder (Palm Oil, Tapioca Maltodextrin). I love this product,True Nutrition has Awsume Service,10 Star.There Oat Starch Non GMO, Blows Away,protein factorys oat muscle in my opinion,I found that True nutrition from now on is my Vegan and Whey protein Store I used Stevia for the sweetner the first time still tasted great.I will be also adding Natural Vanilla next time . Will be ordering more soon, Wished I would have spent my $1200+ over the past 4-6 yrs.At True Nutrition instead! I thought I read a review that this had a nutty flavor due to the veganess (yeah, I made that up) of it. Now I can't find it. Bottom line is, there is no nutty flavor, you can taste full on peas. If you are going to hit something hard with flavor, do it to this. I am not a vegan, I just wanted to try something new and the price seemed like a deal. I went as cheap as possible and got natural vanilla flavoring, lets leave it at, that didn't cut it.